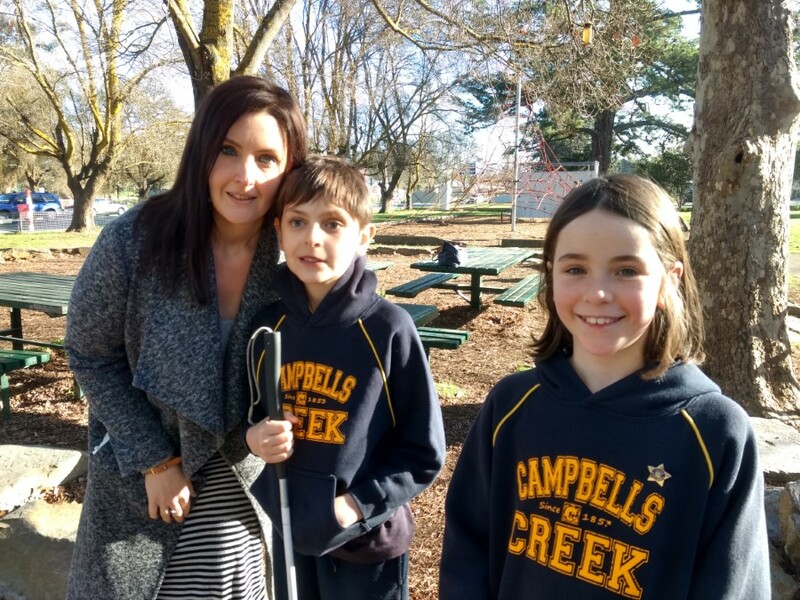 Jarrah (centre) with mum Belle (left) and classmate Mathilde at Campbells Creek PS. When the Midland Express shared Jarrah’s story two weeks ago, Jarrah and his family had no idea how far their story would reach. Nine-year-old Jarrah has lost both of his eyes to retinoblastoma – a rare form of malignant cancer that only occurs in young children. He lost his right eye when he was two and had his left eye removed in May this year in the hope of stopping the cancer. 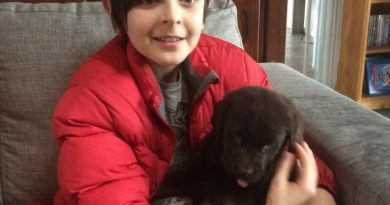 ABC Statewide Drive’s Nicole Chvastek heard the call and within hours, Jarrah and his mum Belle were telling their story to thousands of listeners across regional Victoria and southern NSW. 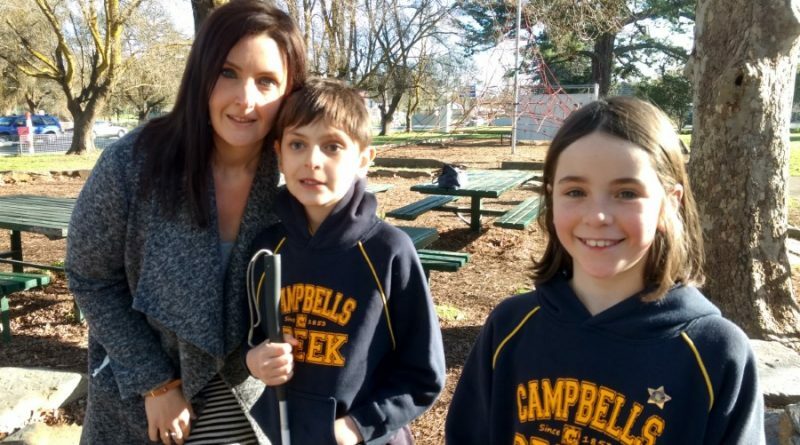 Nine News Central Victoria visited Campbells Creek Primary School to meet Jarrah and his dad Greg. So the word has spread and the donations have started coming in, not only through the Go Fund Me appeal ‘Jarrah’s Fight for Sight’ but also from donors out of the blue. Jarrah’s Fight for Sight campaign organiser and family friend Kym Cross explained they were overwhelmed to receive a call from Ken Stock, chairman of the Michael Manion Wool Industry Foundation, to tell them they were donating $15,000 to this worthy cause. “That donation alone will pay for Jarrah’s prosthetic eyes and the braille note machine he needs,” Kym said. The Michael Manion Wool Industry Foundation was established to honour and remember 61-year-old Michael Manion who died in July 2014 after a short but deadly illness. Michael Manion was a workaholic who lived for buying and selling wool around the world and was looked up to by all who knew him. The foundation was set up to support rural families – especially children – who may be ill or disadvantaged by accidents or other circumstances. “This incredible support is more than we could have ever hoped for,” Kym said. But the campaign is not over yet. Campbells Creek Primary School received another visit, this time from ABC TV’s News Breakfast show, to raise awareness of Jarrah’s experience with their national television audience. “Our goal is to reach $30,000 by September 30 in time for Jarrah’s 10th birthday and thanks to the generous donations and support we are receiving and I think we’re going to get there,” Kym told the Express. Jarrah with his new prosthetic eyes and his puppy dog. 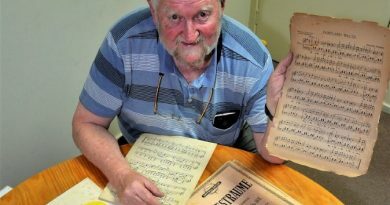 Terry Hodgkins with some of the sheet music left to the Castlemaine Men's Shed by former member Lindesay Hart. 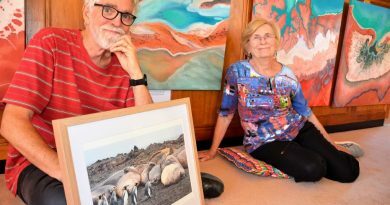 Creative Castlemaine couple Rosie McKenry and Bruce Mitchell share their experiences of imposing places in Earth's Shapes and Colours: Australia and beyond.